According to the Colorado Flu Report for this season, Garfield County ranks toward the bottom in terms of number of flu cases compared to other counties throughout the state. With a fever of 101 and other symptoms to match this week, Garfield County Public Health Specialist Carrie Godes ended up with the very thing she fights every fall and winter flu season. She now joins the statistics she tabulates each year as a sufferer herself of the flu virus. 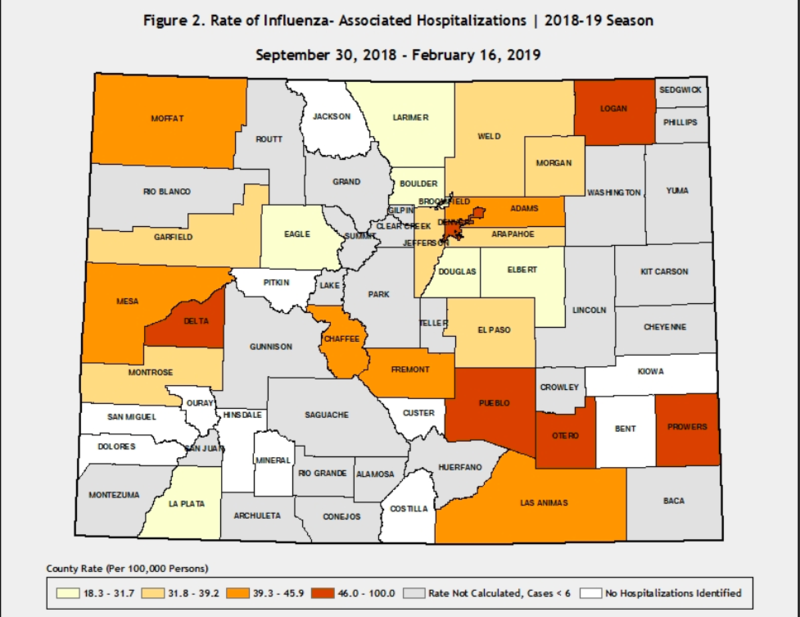 According to Colorado’s flu report, through Feb. 16, 2,054 people have been hospitalized statewide during the 2018-19 season. Overall, the state should see a decrease in flu hospitalizations compared to last year, which was considered an extremely severe flu season. The 2017-18 season saw 4,650 reported hospitalizations throughout the state – a rate of 85.2 per 100,000 people. In Garfield County so far this year, 22 hospitalizations for the flu have been reported among county residents, Godes said. She said all age groups and all six municipalities within the county have been represented in the hospitalizations. Through Feb. 16, Garfield County’s flu rate was hovering between 32-39 cases per 100,000, which Godes said rates towards the middle compared to other counties. Although the flu shot doesn’t completely prevent the virus, Godes wanted to emphasize that even for young adults who don’t think about getting vaccinations, the flu can be dangerous. In her mind, the vaccine lessened an illness that could have been a lot worse. “Getting the flu shot can take one more thing off your plate,” she added. According to the Centers for Disease Control, the 2018-19 flu season vaccine is 47 percent effective overall and 61 percent effective for children ages 6 months through 17 years. While not all flu cases require a hospital visit, Laurel Little with Garfield County Public Health said that persons experiencing any respiratory stress or can’t bring a fever down should consider a hospital visit. She said the most important thing is to not go to work if sick, to prevent it from spreading. She also recommends getting plenty of rest. According to Mesa County Public Health, the Western Slope has seen a bit of an uptick in flu cases reported since the start of February, with 12 new flu hospitalizations since Feb. 10 compared to 64 total since Sept. 30. This year’s flu season is expected to run through about May 18.